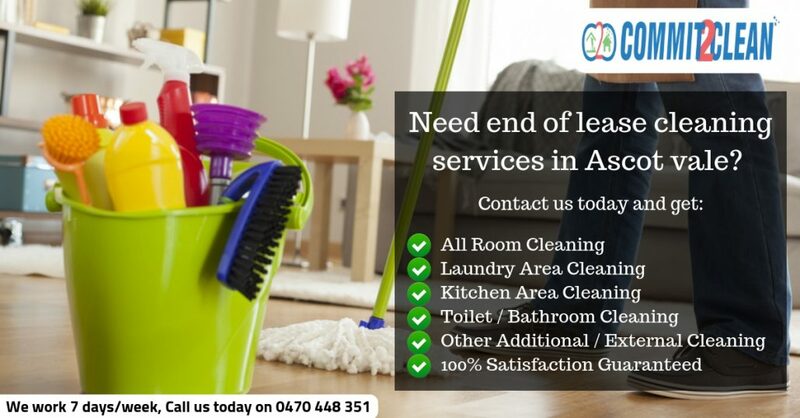 We offer end of lease cleaning Ascot Vale and Many people rely on the search engines to find their cleaning agency. Although we are also relying on the search engines to build out client base, we really like when people ring us and say that somebody has referred us. We have been working in the Ascot Vale area for more than a year now and our cleaning teams are constantly growing in number as the work we have has increased significantly. commit2clean offer end of lease cleaning in Ascot Vale for residential and commercial properties as well as carpet cleaning. We guarantee the excellent quality of our services and if you are not happy with something, we will come back and scrub again. We can issue a cleaning certificate for everybody that requires one. Most landlords would ask the tenants to present such a certificate to make sure that their property has been professionally cleaned and is germ and bacteria free for the next tenants. We use high quality products and the best cleaning equipment on the market. Your home will be clean and safe because all we leave behind is a fresh and clean property. Our products don’t have harmful chemicals in them. We can save you time and money, so don’t hesitate to give us a call on 0470 448 351. Commit2clean will prepare a bespoke quote for you, which will be inclusive of all. We can help you live in a clean home without any efforts and wasted time on your part.